Spacious 3 Bdrm/3 Bath apartment (sleeps 8) in the luxurious Teton Club, in the center of the Teton Village in Jackson Hole, Wyoming. 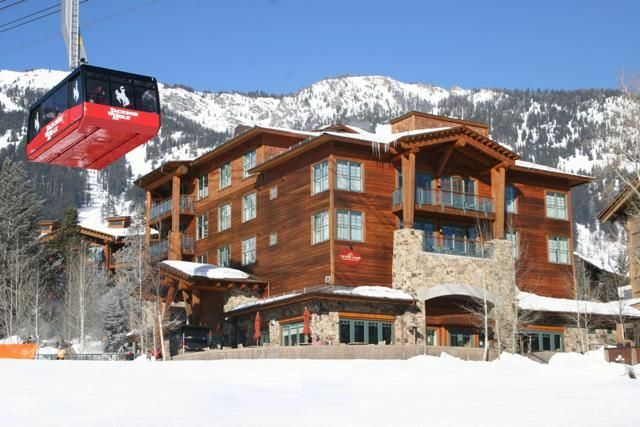 Building is situated at base of Jackson Hole ski area, 20 minutes from the city of Jackson and 1 1/2 hrs from Yellowstone. Building offers all the amenities, including steam room, four outdoor jaccuzies, weight/exercise room, and spa. Furnishings include granite tops in kitchen, leather upholstery, stone fireplace, premium appliances, balconies, private locker for skis and equipment, valet parking and daily maid service. 'Great room' offers evening cocktails and conversation with fellow guests. Plan a day of skiing or golf, shopping in Jackson, a visit to the gym, a relaxing massage, a dip in an outdoor jaccuzy, rejuvenation in the steam room, or a trip into Grand Teton or Yellowstone National Parks. USE INCLUDES TWO DAILY ADULT GREEN FEES AT TETON PINES GOLF COURSE DURING SUMMER MONTHS. Games available for use in Great Room off lobby.